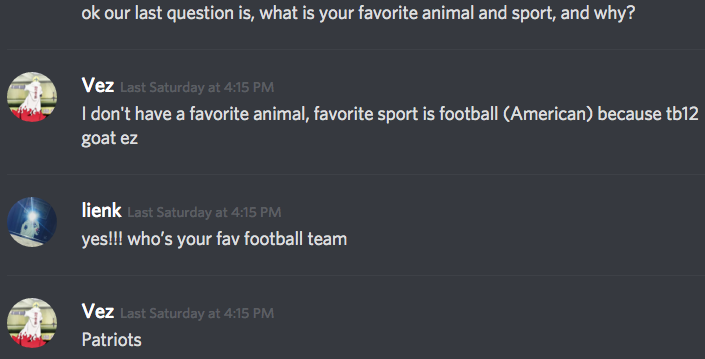 This week marks the forty-third official edition of “Troop Interviews”, where a team of interviewers (currently are Mariss, Litt7, Amadeus23, Marija, Jake, and Klein) asks two or more individuals questions. These questions that are asked may not be the same throughout each interview as it is wanted for each interview to be original and have its own unique highlights. Along with that, the questions asked are to achieve a better understanding of each soldier and how different/similar everyone is to one another. There are many soldiers here in the Rebel Penguin Federation, as you may know so it will be difficult to get to everyone who requests to be interviewed. THE TWO INTERVIEWEES THIS FOR THIS WEEK ARE KYLOBENSOLO AND TWITCHY! Hellooo, it’s Klein with a very special edition of Troop Interviews…because this week, I interviewed the ONE and ONLY Twitchy, our Rebel Commander! Be sure to continue reading for that one! But first up, we have our amazing troop Kylobensolo! 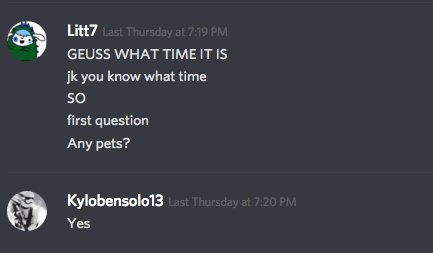 Litt starts off with the basic question of what time is it…it’s clearly 7:19 in the picture?!? Anyways, Kylo does, in fact, have pets! So cute! Kylo’s dogs sound SO CUTE. I wish I had FOUR dogs like wow that’s so much love! Kylo and I are legit twins I love the water and I love Greek mythology and I love Poseidon wow. Coincidence? I think not! 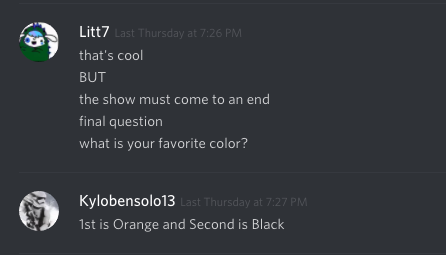 The show comes to a close with Kylo saying that orange and black are his favorite colors! Spooky! 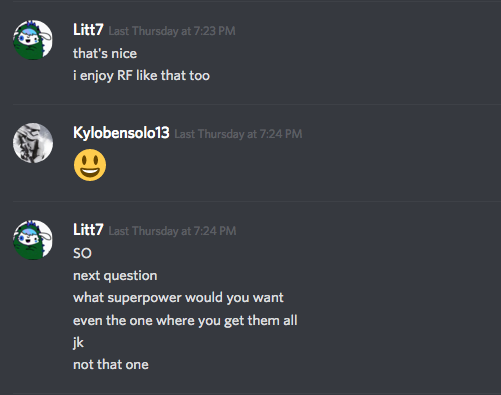 Thanks, Litt and Kylo for that amazing interview! Here comes big league Twitchy’s interview, hold onto your hats! Twitchy starts off strong with that “I have no idea” response. SO HYPE! We continue on to the next q, only to go back to the first! When it rains it really does pour! 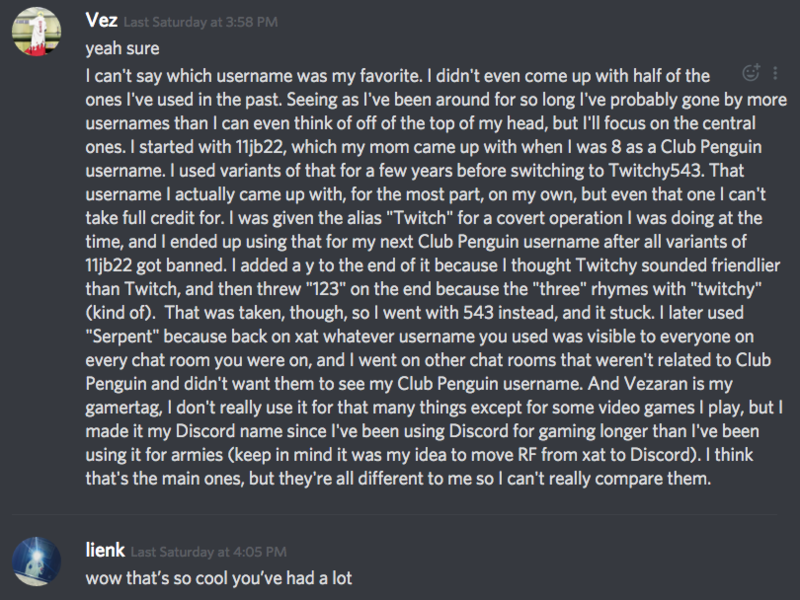 Yall can read that amazing in-depth response because yall have eyes. NEXT UP: His opinion on RF fanfics! RF fanfics have become quite popular recently, and our Rebel Commander’s thoughts on this matter are seen above. The fanfics definitely add some more laughs and gags into our convos! 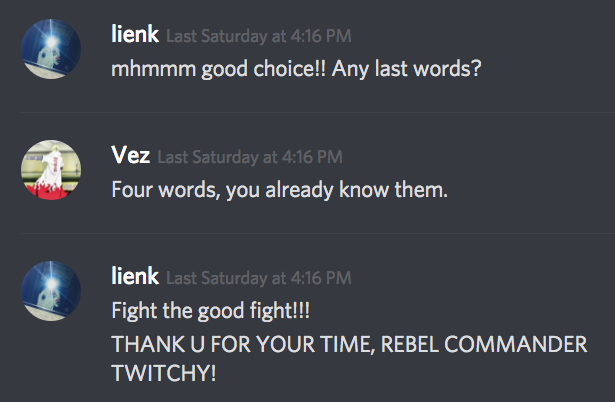 Twitchy already has the power to convince anyone in the world to fight the good fight! That makes him a superhero…wow. Twitchy and Kira are quite the RF ship and sadly, Kira seems to be wanting to be with Rane! But isn’t Rane with Dani, Kira’s sister? #tea Good luck at your marriage counseling! The best animal is a shark, obviously!? But American football is pretty OP, and so are the Patriots. 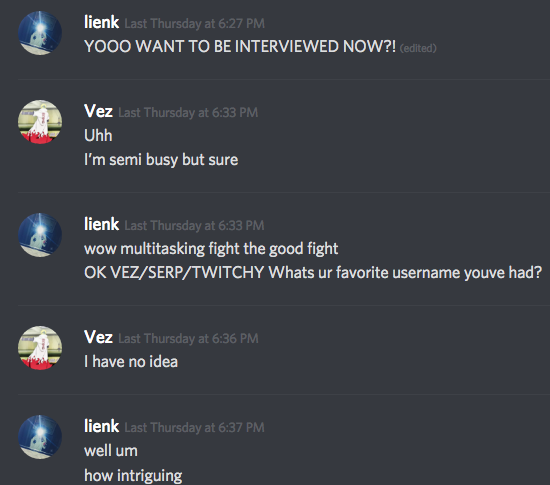 If you have any questions or would like to be interviewed by the interviewing team, DM one of these members: Jake, Marija, MissMariss, Amadeus, Litt7 or Klein. Very nice post! The fanfics want to make me play in traffic!